Present state: Station is still extant except for the trainshed roof which was removed in March 2013. The roadside building was gutted by fire in the summer of 2005. Notes: Manchester Mayfield was opened by the London & North Western Railway (LNWR) on the 8 August 1910. It was located just to the south of Manchester London Road station which was a joint facility of the LNWR and the Great Central Railway (GCR). Originally London Road station had been the northern terminus of the Crewe and Manchester line which had been opened by the London & Birmingham Railway (L&BR) in 1841. At Crewe the line connected to the Grand Junction Railway (GJR) which in turn connected to the L&BR main line at Birmingham. The L&BR and the GJR merged with other companies to form the LNWR in 1846. Over the next half century the LNWR developed an extensive network of lines around Manchester by 1900. Accommodating the train services that ran on them, as well as the GCR services, at London Road was proving to be quite a problem. In particular the LNWR had great difficulty accommodating its long-distance trains because of the high volume of local suburban services that ran to and from the station. The solution was to build Manchester Mayfield which was, in effect, an overspill station. The lines leading into London Road were raised up on a brick viaduct and for this reason Mayfield had to be elevated above street level. The structure connected to the main line viaduct on the south side of Fairfield (London Road station being on the north side). The station facilities consisted of a two-storey building of red bricks with stone string courses. A parapet concealed the roof from view. 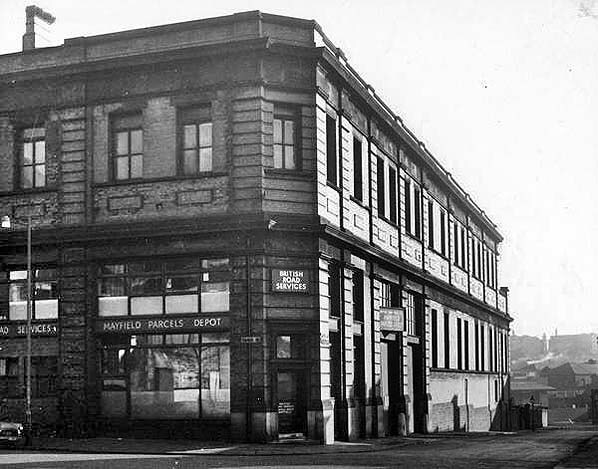 The frontage was on Fairfield and Baring Street. The main entrance was at street level and stairs led up to the platforms. On the north side of the station a ramped driveway led up to platform level providing access for road vehicles. There were five long platforms (four of which were located on two island platforms). 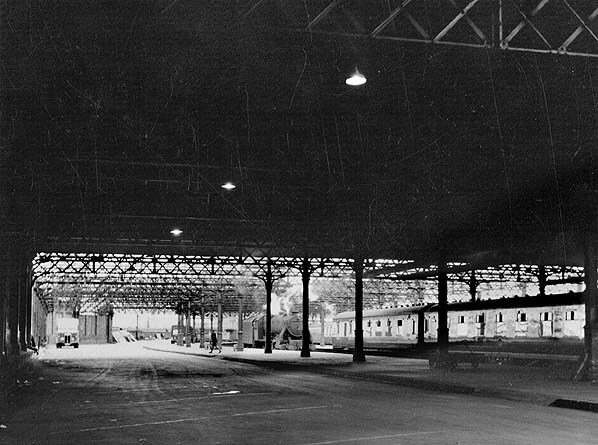 Four of the platforms were protected by a trainshed roof of steel and glass in a ridge-and-furrow design, supported by decorative iron columns; the southernmost platform face was outside the trainshed. Beyond the trainshed at the eastern end of the station, on the north side of the site, were two short bay platforms. 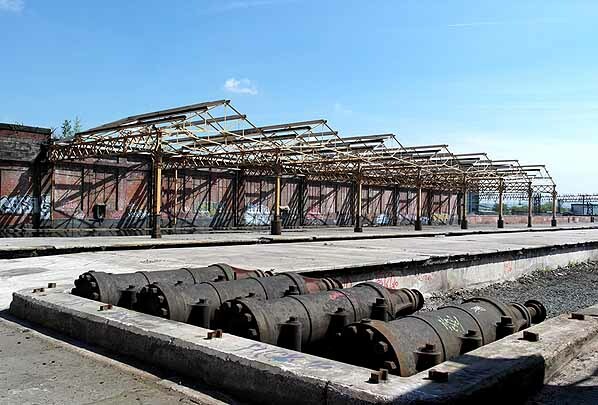 Underneath the platforms, which were raised up on iron columns, were offices and warehousing facilities. A covered footbridge connected Mayfield to Manchester London Road which facilitated the movement of passengers between the two stations. The junction with the main line was controlled by Manchester Mayfield Junction signal box. The box was an LNWR Type 4 elevated above the main line on supporting columns. At the time of opening train services into and out of the station were mostly of a local nature. They served destinations including Alderley Edge, Buxton, Crewe and Stockport. On 1 January 1923 the LNWR merged with other companies to form the London Midland & Scottish Railway (LMS). The LMS summer 1932 timetable showed 13 weekday departures from the station which called at all stations to Stockport. The weekday services ran mostly in the morning and evening rush hours. The situation seems to have altered on Saturday as more Stockport services appear to have operated from Mayfield throughout the daytime; this is perhaps because there would have been numerous Saturday holiday specials running from Manchester London Road. The same 1932 timetable also shows that a number of long distance arrivals used Mayfield Station. On 22 August 1940 Manchester Mayfield was badly damaged when it was hit by a parachute mine during a German bombing raid on the city. By the summer of 1947 there were 13 Monday-to-Friday local departures and 14 arrivals. On Saturday there were 14 local departures and 15 arrivals. In addition there were also summer Saturday-only holiday trains to a variety of destinations. On 1 January 1948 Mayfield became part of British Railways [London Midland Region] (BR[LMR]). Service patterns remained broadly similar throughout the 1950s. Under the BR Modernisation Plan of 1955 the former LNWR main line to Crewe and some of its associated branches were earmarked for electrification using the 25KV AC system (the former GCR line into London Road having gone electric with the 1500 volt DC system on 30 May 1954). Manchester Mayfield was not included in the scheme as it was felt that using electric trains would create more capacity at London Road and Mayfield could be closed. In the late 1950s DMUs were introduced onto many of the services that ran out of Mayfield. This form of modernisation at Mayfield was short- lived as the station was closed on 23 August 1960 to allow the electrification to be completed. Manchester London Road station was renamed Manchester Piccadilly. (Click here to see departures and arrivals in the period 13 June 1960 to 22 August 1960). The junction with the main line was removed shortly after closure and Mayfield fell into dereliction. In the late 1960s work began on converting Mayfield into a parcels depot which opened on 6 July 1970. Alterations were made to the station so that it would suit its new role. 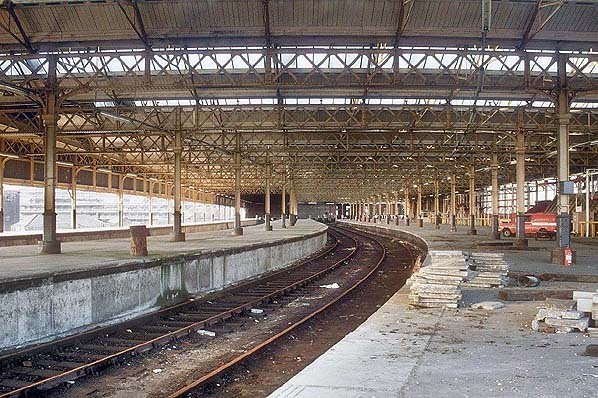 The platforms were raised to facilitate loading and unloading and the roof was refurbished. A new connection with the main line was provided but in a much simpler form than the original. An overhead conveyor bridge was built to link the depot to Manchester Piccadilly. In 1986 the parcels depot closed and Mayfield fell derelict once again. The track was lifted and the junction was removed before September 1988. 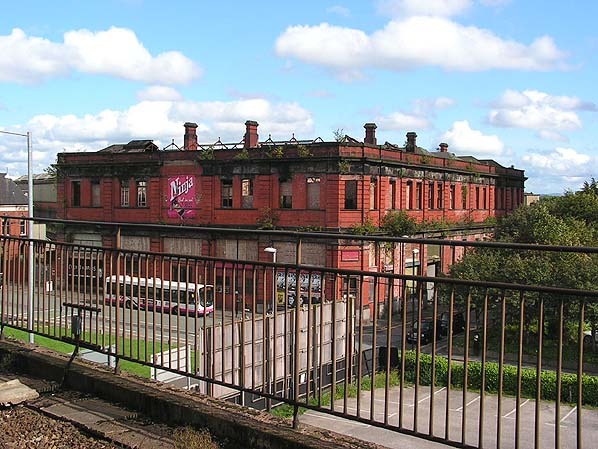 During this second period of dereliction Manchester Mayfield proved popular as filming location. In 1999 it was used for the sci-fi drama The Last Train and in 2005 it featured in the popular crime drama Prime Suspect appearing as a drug dealers’ haunt in Prime Suspect 5. In 2005 the station entrance building was badly damaged by fire. In 2013 the trainshed roof was removed because of safety concerns. 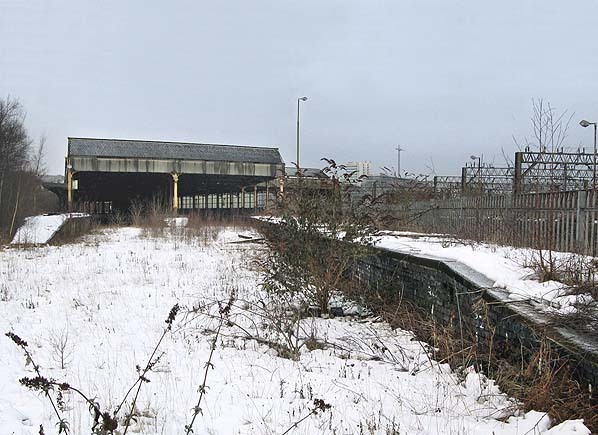 Since the closure of the station as a parcels depot there have been a number of proposals for redevelopment including reopening it as a railway station. None of the proposals came to fruition and in 2014 it was earmarked for demolition, but in 2017 it remains in place. 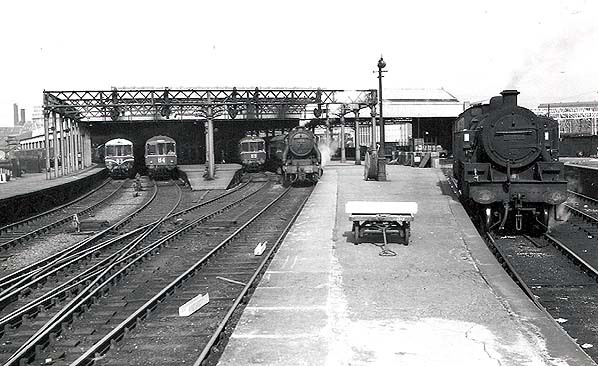 Manchester Mayfield station seen looking south from Fairfield in 1959. Manchester Mayfield station shown on a 6-inch scale map from 1915. The close proximity of Manchester London Road station is clearly illustrated. The covered footbridge that linked the two stations is also shown. Manchester Mayfield station shown on a 25-inch scale map from 1915. 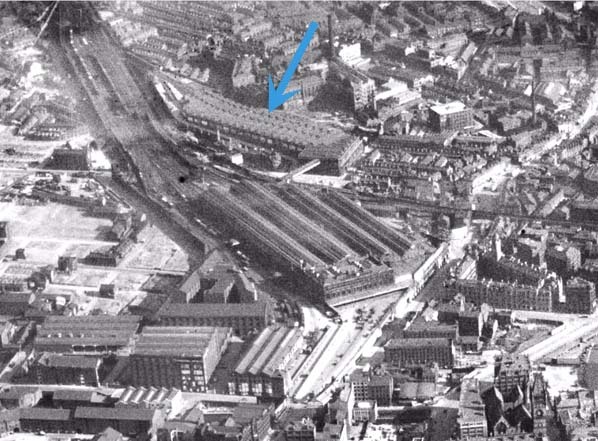 An aerial view of Manchester Mayfield station taken in 1937. A view looking west at Manchester Mayfield station on 30 July 1960. 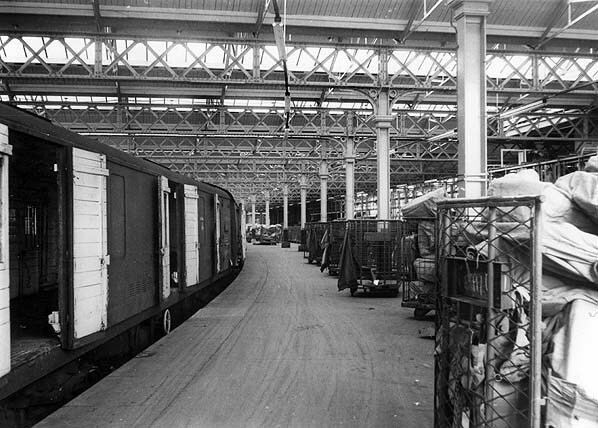 Parcels vans await loading at Manchester Mayfield platform 1 in June 1980. Manchester Mayfield station looking deserted in 1987 after parcels services had ceased. The fire damaged Manchester Mayfield station looking south on 15 August 2009. Looking towards the north-west at the derelict platforms of Manchester Mayfield station in January 2010. The electrified lines on the right of the view lead into Manchester Piccadilly station. been removed in March 2013.